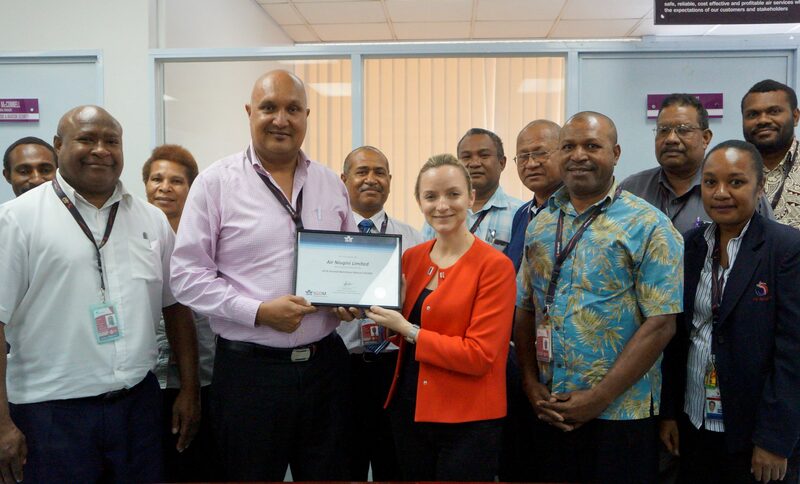 Air Niugini has received the International Air Transport Association (IATA) Ground Operations Manual (IGOM) certificate after successfully reviewing and conforming its manual to be consistent to IATA standards. Air Niugini has become the second airline in the South West Pacific after New Caledonia’s Air Calin to have received the IGOM certification. The review covered functions for the airport, passenger, cargo and security ground handling procedures which have enhanced the organization’s efficiency and safety with industry best practices. IATA’s Regional Vice President for Asia Pacific, Conrad Clifford in congratulating Air Niugini said it is among the early adopters of IGOM in the South West Pacific and that he looked forward to working closely with Air Niugini to implement other IATA initiatives in Papua New Guinea. “Safety is the number one priority of the airline industry, and together with its IATA Operational Safety Audit certification, Air Niugini is demonstrating its commitment to keep their passengers and staff safe, both in the air and on the ground.” Clifford said. Air Niugini’s Acting Chief Executive Officer, Marco McConnell said the airline’s IGOM certification indicates Air Niugini’s obligation and determination towards continuous improvement in safety at the industry level. He said this also provides reassurance to foreign airlines that operate into Papua New Guinea that ANG can handle and deliver their aircraft with a high level of safety and efficiency. “Adopting internationally recognized standards mean reduction in operational risk as we standardize policies and procedures with industry partners globally. It also encourages overall comfort for our interline partners as well as passengers to know they have made the right choice by choosing us“. Marco McConnell said. The IGOM certificate was presented during IATA’s workshop in Port Moresby last week. The review of Air Niugini’s Ground Operations Manual took a few months to complete and involved teams from Ground Operations , Engineering, Flight Operations, Cargo, Catering and Aviation Security. It was developed in response to industry demand for enhanced safety in ground operations.